Amongst the many fine things that the Thai people love, is coconut! 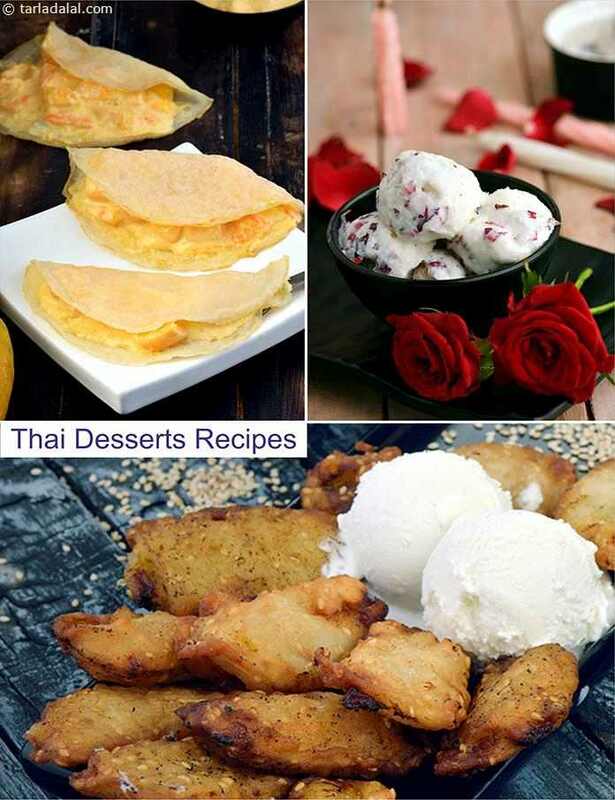 like in the cuisine of Indian coastal towns where coconut is in abundance, thai cooking too features superfluous use of coconuts, in everything including ice-cream! you will love the creamy and nutty flavour, and soothing texture of the Coconut Ice-cream . Thai-style Bananas : Banana fritters that form the base of this dessert are made with a sesame-tinged batter, which imparts a very appetizing aroma to it. The addition of coconut further enhances the texture of these fritters, making them quite exciting to bite into.The batter-coated banana slices will take some time to turn golden brown and crisp, so do be patient while deep-frying them. Drain the fritters, and serve immediately, topped with mouth-watering vanilla ice-cream. An icy cold, refreshing sorbet ideal for a hot summer’s day! With sweet mangoes, tangy lemon and zingy ginger, the Mango Ginger Sorbet will touch every cell in your body and tickle them back to life even at the most tiring moments. In the mood for a warm and delicious dessert? The temblaque is ideal! Coconut milk, corn flour and sugar is cooked into thick custard and served chilled with mango and strawberry sauces! Try this one and you will be pleasantly surprised! You can add any of your favorite fruit instead of tender coconut. A delicious sweet pumpkin desert eat as a mithai!